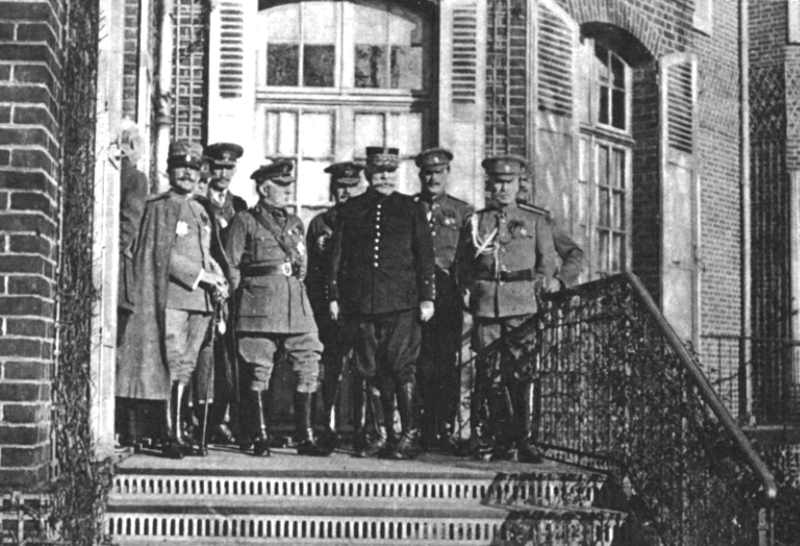 Yesterday, a three-day conference of general officers representing all of the Entente powers ended in Chantilly with an agreement to pursue simultaneous offensives against the Central Powers in the new year and maintain the coalition base at Salonika. 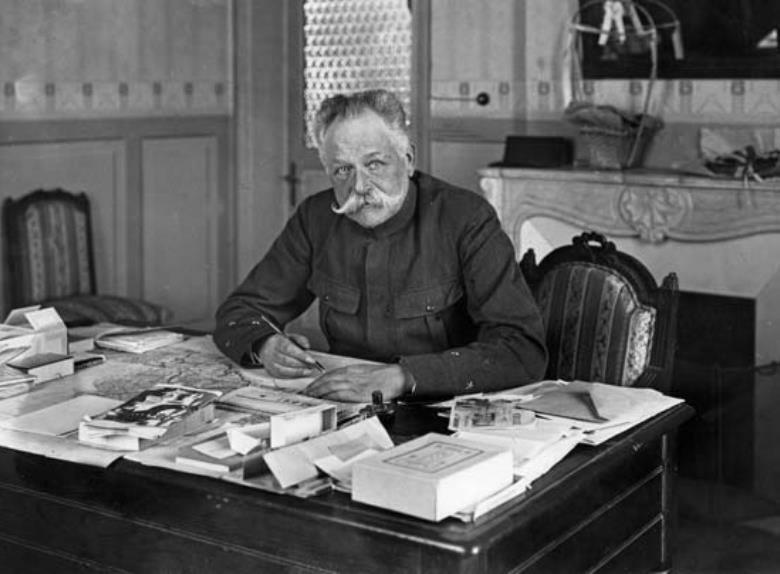 Seen above in the dark uniform, Field Marshall Joseph Joffre wanted to maintain the position in neutral Greece even as the Serbian Army disintegrates in retreat, and so today a political conference in Paris reaches the same conclusion. It is the latest example of the cross-channel partnership drawing closer together in answer to their military disappointments of 1915. 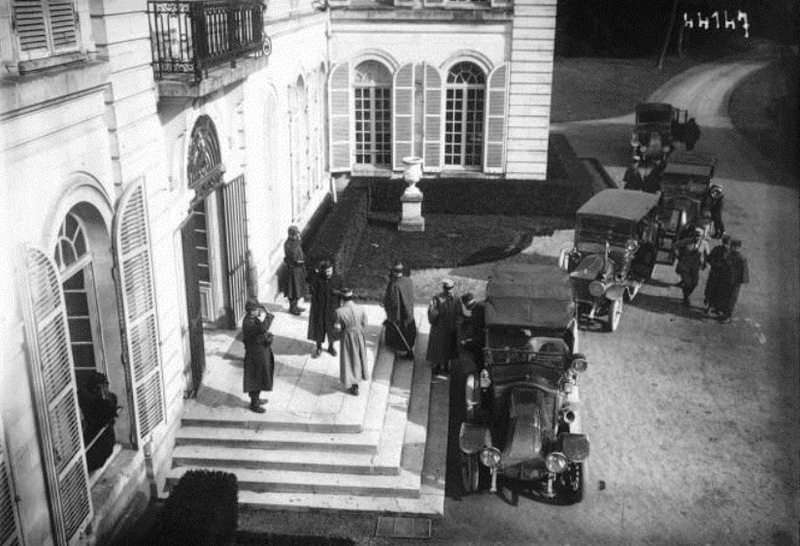 French Prime Minister Aristide Briand and his Minister of War Joseph-Simon Gallieni meet with British ambassador Lord Francis Bernie, Foreign Secretary Sir Edward Grey, and War Minister Lord Horatio Kitchener, who recommended evacuation of the Salonika beachhead after his personal inspection of allied operations in the Dardanelles. The two operations are tied together in his mind, after all; ironically, Kitchener had originally envisioned an operation to support the Serbs via Salonika in January, but during the Churchill-influenced War Cabinet discussions that took place the first several weeks of the new year, his initiative morphed by consensus into the disaster at Gallipoli. Far away from western capitols, actions with long-term consequences are already underway across the Balkan region today. Italy is landing more troops at Vlorë, the Albanian city across the Otranto narrows that they have occupied since December, to support the desperate Serbian retreat — and look after Italian imperial ambitions. 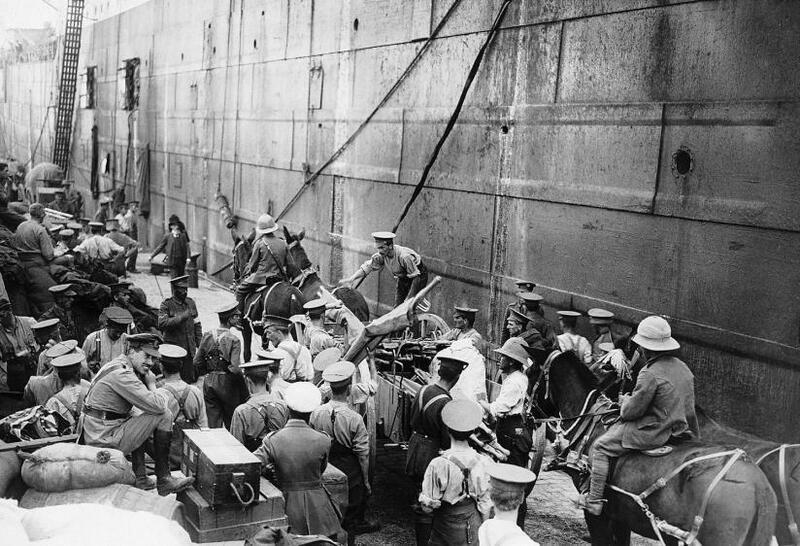 Having agreed to deliver supplies for the incoming columns, the Italian Navy is producing a logistical disaster, failing to deliver food or blankets to the line of march. The entire Serbian nation is overrun by its enemies, with Monastir, the last free town in Serbia, falling eight days ago. Shattered and demoralized, the Serbian troopers now die in their tens of thousands, beset by harsh weather and revenge-minded hill tribesmen alike, with the hardy and lucky survivors trudging into the Adriatic ports of Albania and Montenegro exhausted and starving. First envisioned as a means to bolster their ally, Britain and France will now maintain Salonika in hope of eventually restoring them from total ruin. Eventually — for it will take years to build up the force levels necessary for offensive actions against the armies of Bulgaria, Germany, Turkey, and Austria in the Balkans. Today, French General Maurice Sarrail simply lacks the manpower to engage them: his force of 150,000 is outnumbered nearly three to one. 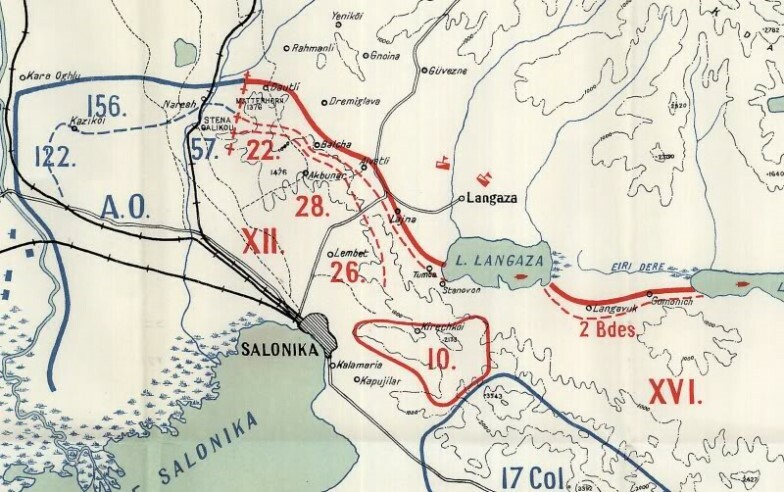 Estimating he will need at least another 100,000 soldiers to hold Salonika, Sarrail’s army is in its fourth day of a fighting retreat from positions in Vardar Macedonia to the safety of Greece, methodically using prepared defenses to punish Bulgarian attacks in column formation. A series of bloody rearguard actions have prevented a disastrous enemy breakthrough, but today the assault intensifies at Cerna and Cestovo and Gevgelija, driving the French 10th Division backwards along the Vardar. Thanks to a complete lack of maps and a persistent fog that prevents air observation, a Bulgarian attempt to navigate the trackless mountains above Lake Doiran and cut off Sarrail’s retreat today fails. Seeing no alternative, he orders the evacuation of his position at the village of Dedeli tomorrow evening. On December 12th, his 30th Brigade headquarters leaves the Macedonian town of Doiran by train just ten minutes before the first wave of Bulgar infantry arrives. Only a political tide line stops them. Unwilling to invade neutral Greece, where King Constantine I has thrown his country into a political crisis rather than join the Entente alliance against his brother-in-law Kaiser Wilhelm II, the armies of the Central Powers have streamed through conquered territories only to halt at the Greek border as by secret agreement. The Athenian monarch has refused to let the Serbs retreat into Greece, and while Constantine dares not fire on the Entente allies, he can still make them uncomfortable. Some Greek stationmasters refuse to allow troop trains through, forcing Sarrail’s command onto the relatively poor roads. 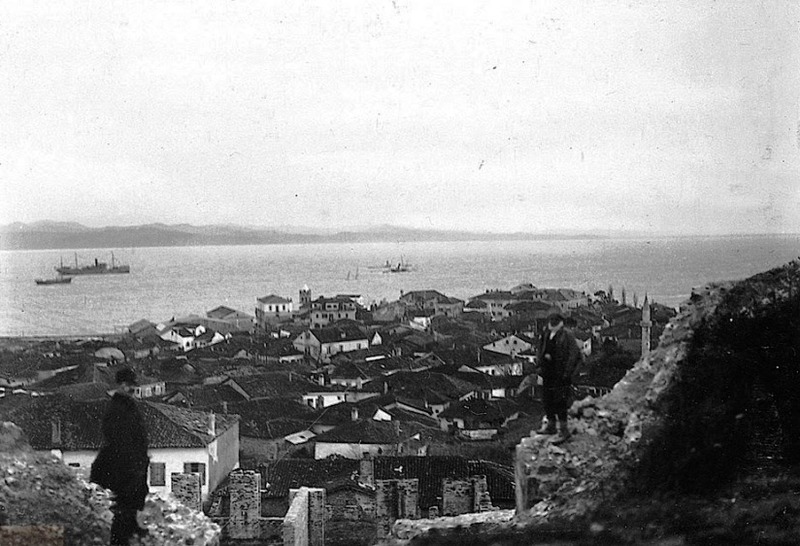 As the British and French troops dig in, forming a strong perimeter around the Halkidiki peninsula, watchful eyes observe from Greek Army positions on the heights. In the months to come, Constantine’s creative measures to persuade the allies to leave will bring him into ever-greater conflict with Paris and London, whose leaders are unwilling to dishonor themselves by forcing his abdication. In the meantime, both sides hunker down for a long, cold winter.